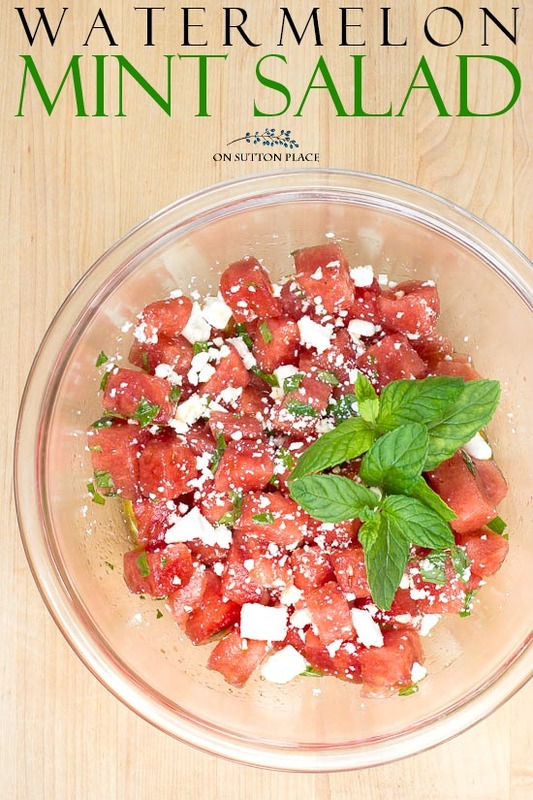 Make this fresh Watermelon Mint Salad with Feta Cheese for an easy summer side dish. It’s perfect for any family gathering or summer party! As promised when I shared my container herb garden, I’m back with a refreshing salad recipe that combines watermelon, mint & feta cheese with a delicious olive oil dressing. Some of you may be thinking that watermelon is perfect on its own and it is…but this recipe dresses it up a bit. 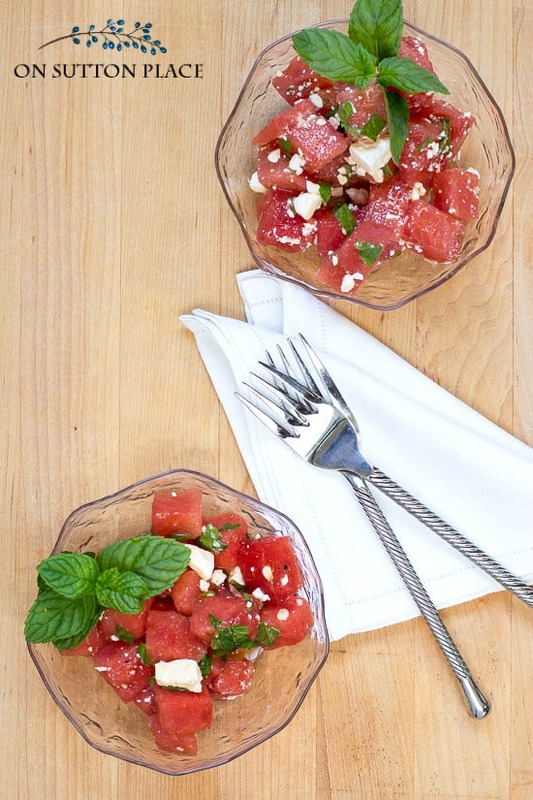 This watermelon mint salad is colorful, amazingly fresh and perfect for a summer al fresco dinner. The recipe is simple and chopping everything up is extremely satisfying. We didn’t eat the whole batch the evening I made it. I refrigerated the leftover salad in a covered bowl and had it the next day for lunch. It was actually very good. There was quite a bit of the dressing gathered in the bottom of the bowl but it didn’t make the watermelon soft or mushy. I scooped it out with a slotted spoon and enjoyed it immensely! Fresh and tasty summer salad that's perfect for al fresco dinners! Place chopped watermelon in a large bowl. Combine olive oil, lime juice, salt and pepper. Whisk well. Pour olive oil dressing over watermelon and gently toss. Sprinkle with chopped mint and crumbled feta. Toss again so all ingredients are combined. Serve immediately. If you are waiting to serve, refrigerate until ready. The dressing will fall to the bottom of the bowl. That's fine. Use a slotted spoon to dish out the servings. Adjust the mint and feta amounts to your taste. There is enough dressing to cover up to 10 cups of watermelon so feel free to use more. There is something about the olive oil & lime juice combined with the sweet watermelon that makes this salad so tasty. The mint is subtle and doesn’t overpower…and the feta adds a creamy texture. I really loved it and will definitely be making it over and over again. I noted in the recipe that you could use more watermelon without increasing the amount of dressing. Another idea is using just half of the dressing and saving the other half for another time. It would be delicious on any sort of lettuce or pasta salad. It’s going to be my go-to homemade dressing from now on! Thank you so much for stopping by…see you soon! Click to subscribe and get my eBooks! lovely salad ! Thanks for experimenting a perfecting it for us, just in time for a family dinner! We love your recipes. I used your baked spagehetti all the time. What I need are reliable family recipes not exotic, try something new recipes. Thanks for the recipe. I was recently at the Findlay Country Club where they served a wonderful watermelon salad. Probably wouldn’t have ordered it but it was delicious! Thanks for the recipe. I’m anxious to try it. This sounds wonderful. I will make it this weekend and bring to a picnic. Ann, this is an interesting combination of ingredients. I always think of watermelon as something eaten alone or in combination with other melons. 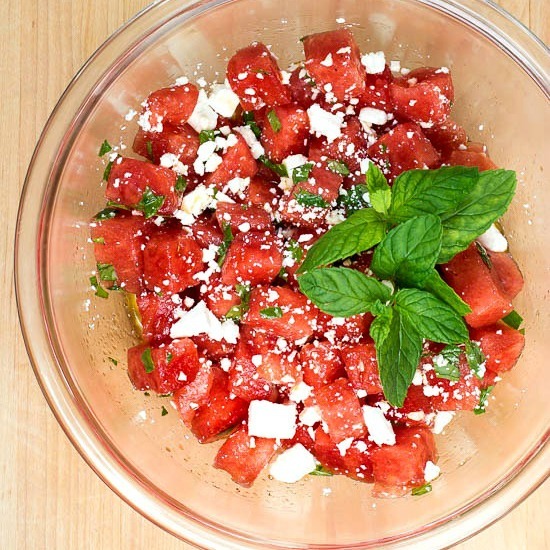 Watermelon with mint and feta cheese dressed with olive oil and lime sounds utterly refreshing! My husband has to push himself away from the table when he has watermelon in front of him, I know he will love this. I pinned this one, as soon as we have some good ripe watermelon, this will be on my table. Thanks for a fun summer salad recipe! Love this refreshing sounding recipe! We didn’t plant any watermelon this year but a neighbor has a field of them growing! I’ll be making this soon! I love this recipe and can’t wait to try it. I can tell by reading the ingredients that it will be something we will love, especially my husband who adores watermelon. Thank you for sharing this! I love your blog. Can’t wait to try???? 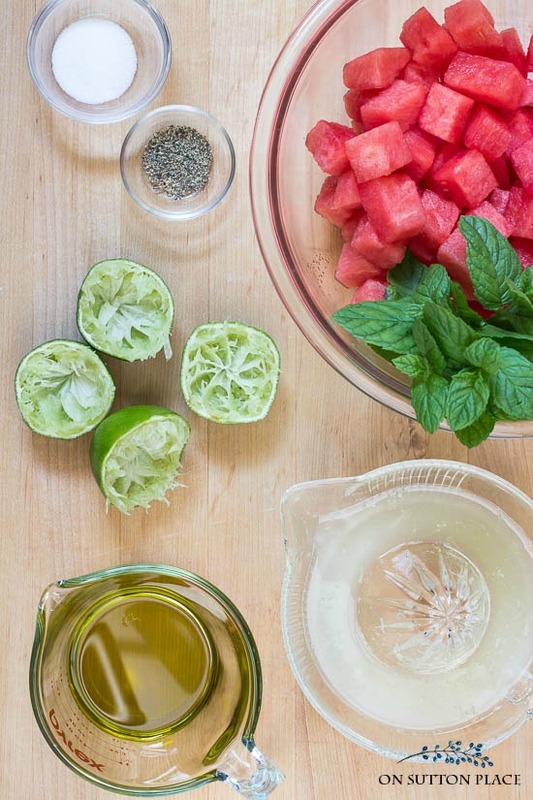 Sounds so refreshing,another Ann recipe pinned. That looks and sounds delish! This looks so good! Had to pin it for safekeeping. Pinterest is my “vault”…ha! Does it matter which kind of mint is used? Thanks for that Ann, that sounds like it might become a summer favorite for me. We all love watermelon and I’m always looking for new and different salads for the summer and these flavor combinations sound really good.